Is it technically a pea-souper? Not sure yet but watch out, there's a fog about and the Met Office have issued a severe weather warning this evening, which you should also heed for the morning. Driving conditions could be difficult - especially tonight - so please take care. 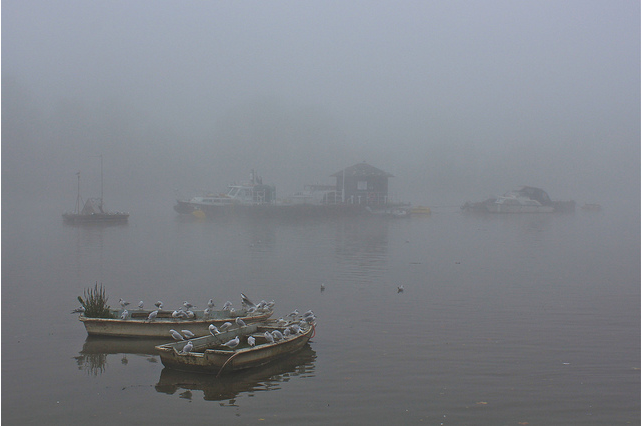 Fog is also affecting flights in and out of London. Aside, we like the BBC's new weather pages which give you London's latest much easier. Check out Shard fog 2011, Shard fog from 2010, the smog of 1952 and an archive post about fog in 2006.